If you live in Alameda County or the surrounding communities of Northern California, and you stand accused of any type of criminal charge, you deserve to have the best criminal defense on your side to help you protect your rights and preserve your freedom. At The Law Office of Christopher A. Lamiero, A Professional Corporation, in Dublin, California, we promise to do whatever it takes to help you achieve the justice you seek. Our law firm's founder, Christopher A. Lamiero, possesses more than 25 years of criminal law experience, most of which he acquired during his service as a state prosecutor. This means he has invaluable insight into the criminal justice system, and he established our law firm in order to help those accused of criminal offenses achieve the best possible outcome for their situations. We understand how scared you may feel and how you are likely uncertain as to what your future holds. As such, we will work with you one-on-one to address your questions and concerns in an attempt to offer you some peace of mind about your situation. You do not have to face your challenge alone; however, you need to act quickly to increase your chances for success. 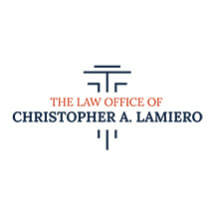 By contacting The Law Office of Christopher A. Lamiero, A Professional Corporation, as soon as possible, you can take advantage of our law firm's free consultation and begin the process of securing a brighter future for yourself or a beloved family member.